I rode the momentum of a national election and water crisis for my own benefit. In late October 2018, a water crisis arose in Austin, TX. Due to disastrous flooding, debris and foreign objects flowed into city water cisterns and panic ensued throughout the capital. Residents were urged to boil water, once plentiful salad bars became vegetable deserts, and Starbucks was barred from selling fresh brew — oh the humanity! I came to call this daunting time, Watergeddon. To make light of the situation — and coincide with the ongoing election — I fashioned a set of “I Boiled” buttons for the office. The first 50 buttons were gone within 30 minutes, and the subsequent 100 were gone in a matter of hours. 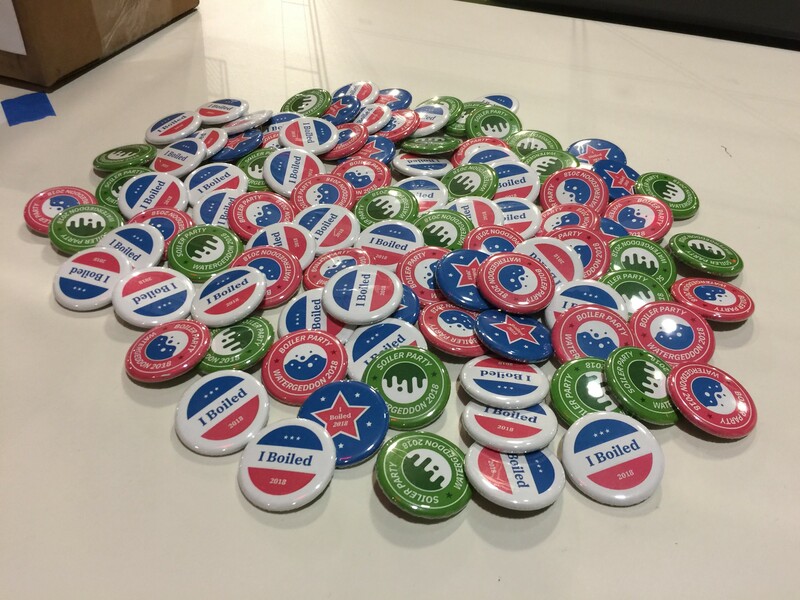 Unknowingly, scores of colleagues were taking “I Boiled” buttons. But would they have taken them if they knew what they were supporting? It was evident that this modest creation was meant to fulfill a higher calling. And that higher calling took the form of a — completely ethical, mind you — social experiment on my friends and colleagues. The hypothesis: Due to our busy lives, most people rely on headlines and talking points to inform their decision-making. And during an election, a plethora of tactics used by political hopefuls can successfully steer voters from the truth. Utilizing small design hacks, I wanted to see if I could swing “voters” to choose a party that had a great image but a less than ideal foundation. The plan: Hold a hypothetical election pitting the fictional Boiler party against the also-fictional Soiler party for the control of Austin’s also-fictional water policy. “Keep the boil rolling,” is the official Boiler slogan. With a phrase that catchy, and a color scheme gleaming with patriotism, it’s hard to look the other way. History recounts that when a populace is in danger, any path that leads to solace is a path much traveled. “Boiling is toiling,” accompanies the meager image of the Soiler party. A color palette most notably resembling your aunt’s green bean casserole, the Soilers were given an identity that made it objectively difficult to gain voter support. Why would you pick casserole-green over the classic freedom-trio of red, white, and blue? At this point, who would you vote for? The buttons kept disappearing; momentum was on my side and time was of the essence. I produced hundreds of buttons, placed posters on the walls, and beefed up my digital messaging efforts. All that was left was to create the polling station. Buttons and posters only told so much of the story and it was my civil duty to provide voters with factual information. In advertising, companies are mandated to provide consumers with an array of clarifying, cautionary, and legal text. Shouldn’t political parties do the same? Oh wait, they do, sort of. In accordance with those same legal mandates, I provided each party’s stance on water governance followed by a list of party criticisms. This way, voters would get a melting pot of fact and opinion which would help them reach their own conclusions. 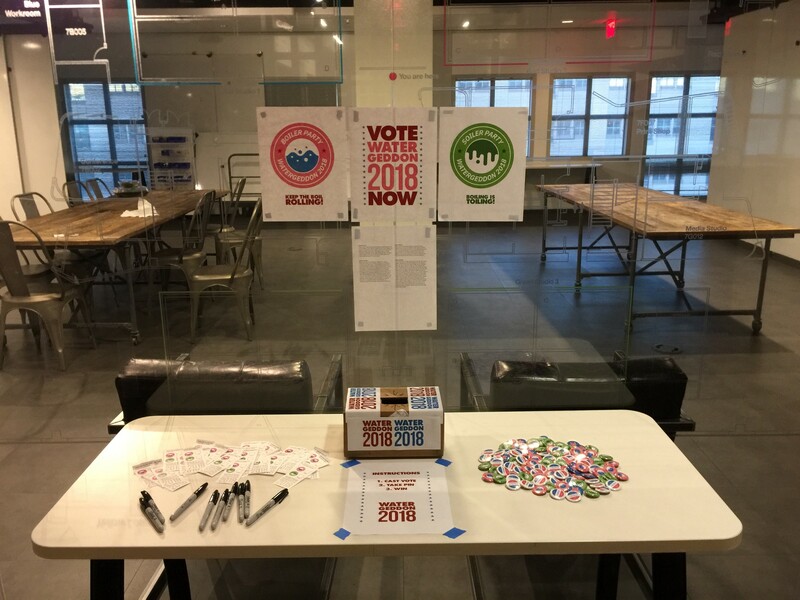 But… I had a hypothesis to test; and like anyone with something to hide, I printed these important documents in an 8-point font and placed them directly under an eye-catching “VOTE WATERGEDDON 2018 NOW” banner. In other words, I’m a piece of sh–. All that was left was to provide an instruction list (Cast Vote, Take Pin, Win), a stack of ballots, and a ballot box. The ballot box was constructed using an Amazon Prime box. A company who simultaneously fills the role of innovator and human rights violator, I thought it only fitting that they play a part in this important event. Dim lighting was used to simulate an actual polling station. If you’re so inclined, here is the low-down on both parties. Boilers view a world where boiled water is the only way to provide clean drinking water to a mass populace. Water filters and chlorine tablets are merely an industrial guise that do little to provide clean drinking water. Bottled beverages, juices, coffee, and adult beverages are viewed negatively by the Boilers and are subject to potential bans if the Boilers achieve a majority in the local council. Soilers view a world where beverage consumption should be regulated only to the point of health assurance. They view bottled water as a perfectly fine alternative to city tap water — going to so far as to encourage the purchase of bottles that are made of 100% recycled plastics. As avid coffee drinkers, the Soilers are sure to oppose any beverage ban proposed by the Boilers. 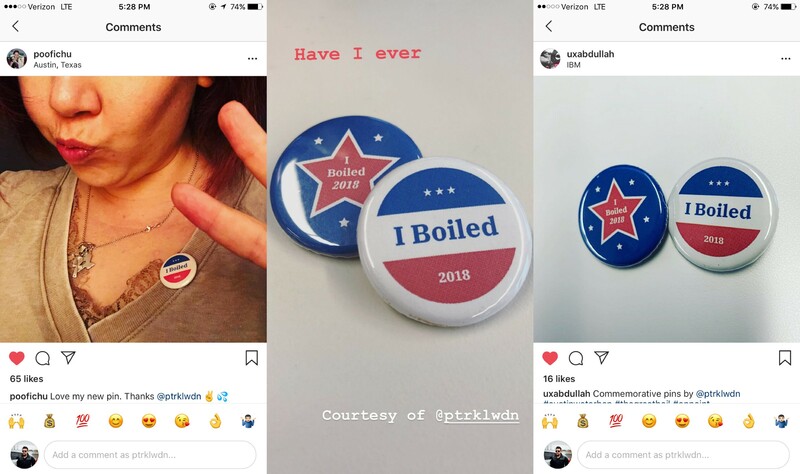 While the Boilers current campaign of “Keep the boil rolling” is positive and uplifting, there have been a number of controversies in how they go about their politics. Looking through the Boilers 2019 water provision plan, an unnamed source uncovered that in the act of boiling water, the local government and utility services see a near 50% increase in revenue generated from the electricity and gas needed to boil water. Are we boiling to keep ourselves safe or to line the pockets of local politicians? Additionally the city of Austin saw a near 15 million gallon deficit when locals feverishly boiled for their lives. This saw small water outages across the city but brings up a fair question, “Could Austin sustain a boil-only doctrine?” With the city’s population increasing year over year, and flooding now a regular occurrence, it’s unclear how the Boilers will respond to the ever-growing need of improving and maintaining this infrastructure. As usual, the Soilers continue to fall behind in the polls. Their public image is atrocious and while their candidates serve as beacons of hope, their lack of funding and outward image continue to dampen their hopes. People often ask, “where did it all go wrong for the Soilers?” It all harkens back to 1986 when during a local rally, Soilers party leaders were observed drinking water from a boiled rather than bottled source. Local legend Willie Nelson condemned the act as “traitorous” and later followed by saying, “it just ain’t right.” Nelson’s words served as a rallying cry across the nation which led to a split along Soiler party lines. Many argue that the night’s events inspired Nelson’s thirty-fifth studio album titled “Island in the Sea.” However in 2016, Nelson admitted to consuming both bottled and boiled water throughout his life and that the events of 1986 played no part in the creation of “Island in the Sea” or his next 30 album releases. While many argue that the Soilers stand for more realistic water practices and have experienced almost no controversy since that event, they’ve only just begun to rekindle support. Will it be enough to push them through? Unlike freedom, these are free. Curiously, we had 2 write-in candidates: “I Don’t Get It” and “Who Cares.” While their efforts were noble, they consisted of less than 1% of the vote, once again proving that democracy can make your wildest dreams come true, or throw you into a tail-spin of sorrow and regret. I wasn’t quite sure how this would all play out and I admit that stuffing the ballot box with boiler votes was an initial part of my plan. Luckily, the voters did the dirty work for me and chose the Boilers all on their own. As Watergeddon 2018 concluded, my hypothesis was proven true as the Boilers more than doubled the Soilers in votes. Had this election been on the local ballot, we could have created a boil-centric oligarchy that negatively impacted the city and its population. The morning following Watergeddon, the same daft excitement that once filled the office air was once again hushed by the necessity for salaried workers to perform their corporate duties — myself included. Bringing this back to reality, I’m pleased to see a record-breaking voter turnout in 2018. Midterm or “off-year” elections rarely draw a crowd but so many important issues are decided at the local level. I know that the endless amount of propositions, candidate voting records, and local opinion can prove daunting, but it’s so important to take it all in and make your decision. If I was able to sway an “election” using basic design hacks with my limited brain capacity, imagine what well-funded political action groups, lobbyists, and corporations are capable of?